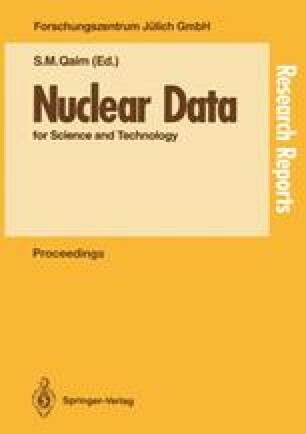 The reactor-neutron cross section of the reaction 137Cs(n,γ)138Cs has been measured by means of a radiochemical method. First, the thermal neutron cross section, including a contribution of epithermal neutrons, was determined and found to be twice as large as that of the previous work by D.C. Stupegia. Second, a modified Cd-ratio experiment was carried out, using a movable cadimium shield in a reactor. The thermal neutron cross section (for 2200 m·s−1 neutrons) was 0.25±0.02 band the resonance integral 0.36±0.07 b. In the analysis of the experimental results, a possibility of the production of the 138Cs isomer (T 1/2=2.9 min) was disregarded. The model calculation for the isomeric yield ratio in s-wave neutron capture of 137Cs showed that the cross-section values obtained have a probable error of +1.2% or +3.9%.